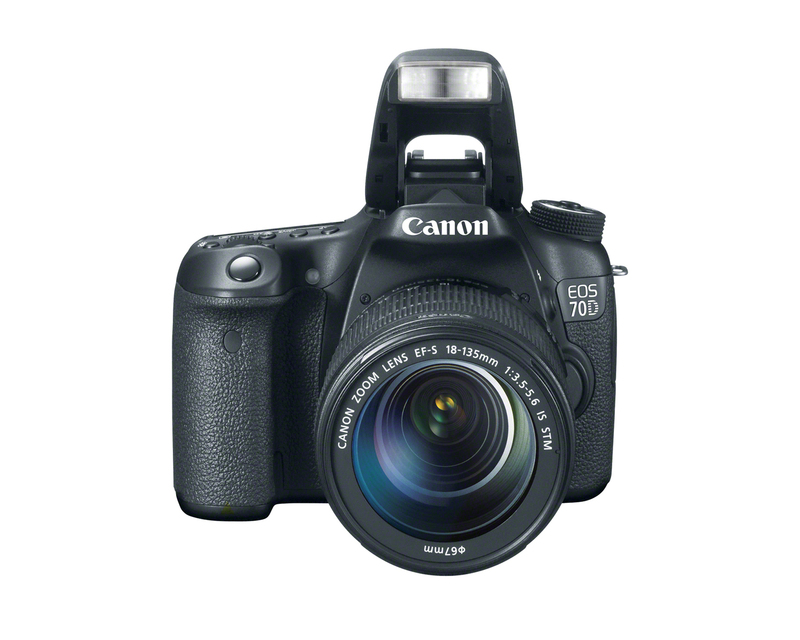 Canon has unveiled long anticipated replacement of EOS 60D, the EOS 70D. 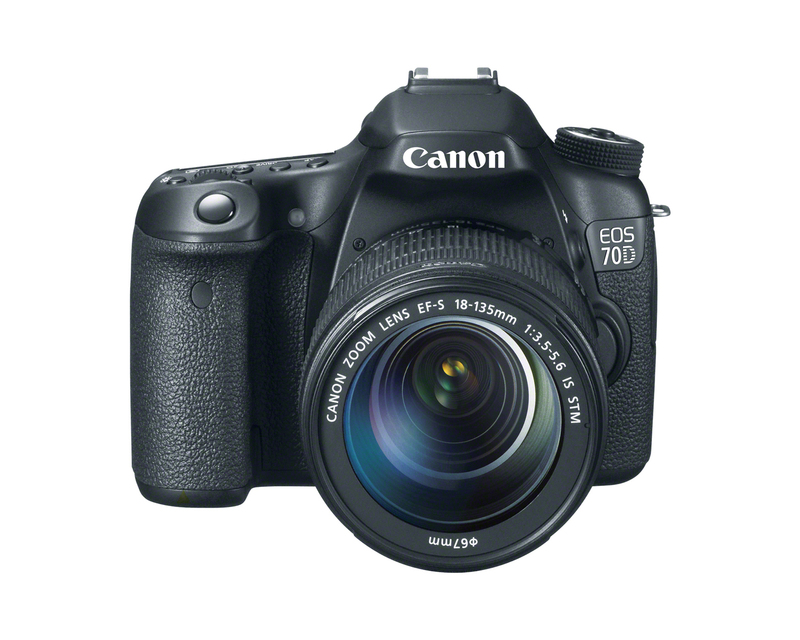 Made to be the tool of choice for serious photographers and semi-professionals, the EOS 70D features an brand new 20.2-megapixel APS-C size CMOS sensor and DIGIC 5+ image processors, ground-breaking Dual Pixel CMOS AF technology, to capture tremendous images at up to ISO 12800 and speeds of up to 7 fps, with up to 65 JPEG or 16 RAW images in a single burst. The EOS 70D has a all cross-type 19-point AF system with improved AI Servo AF subject tracking for sharp focus no matter the situation. The EOS 70D’s Intelligent Viewfinder provides 96% coverage and displays user-selected AF modes as well as electronic level and on demand grid lines. The EOS 70D now has a built in Wi-Fi capability like EOS 6D, enables wirelessly control camera & transfer images to any compatible devices. 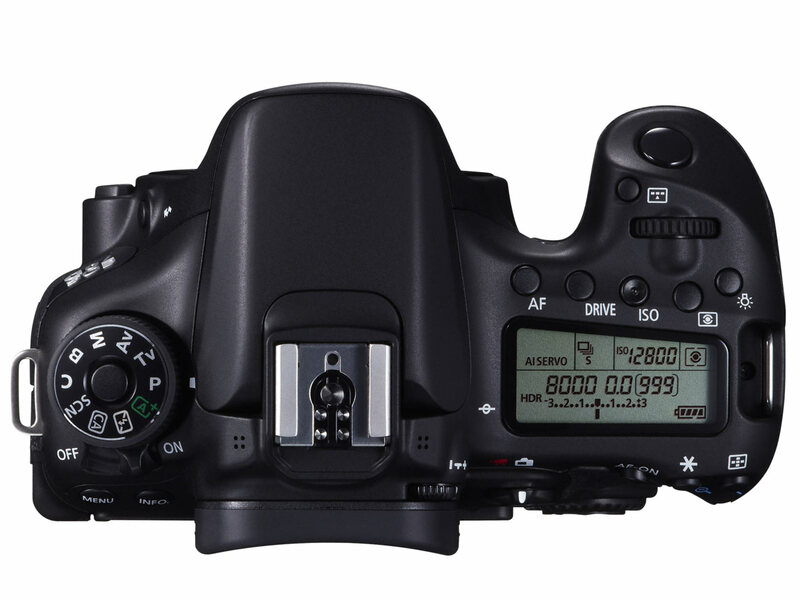 EOS 70D also added few creative features like in camera HDR, Multiple exposure and a 3″ Vari-Angle Clear View LCD II Touch screen with a sharp 1,040k dot resolution for difficult angle shooting. The EOS 70D features a new, Canon-designed 20.2-megapixel APS-C size CMOS sensor that captures such a high resolution Images, for easy cropping without concern of losing detail. The new sensor assures that images shot at highest sensitivity will be remarkably smooth. 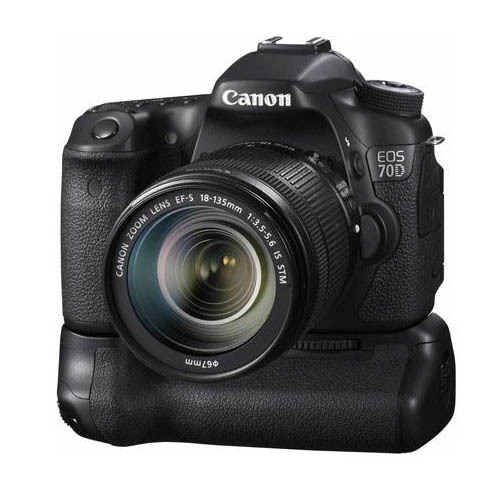 Canon EOS 70D is the world first DSLR to have Dual Pixel CMOS AF. According to canon “Dual Pixel CMOS AF is a sensor-based, phase detection Auto Focus (AF) technology, designed to provide smooth, high-performance focus tracking in movies and fast autofocus acquisition when shooting still images in Live View mode. It is a unique, Canon-developed technology, which is ideal for creating professional looking pull-focus effects and keeping a subject moving towards the user in sharp focus while maintaining a blurred background – a defining characteristic of EOS Movies. 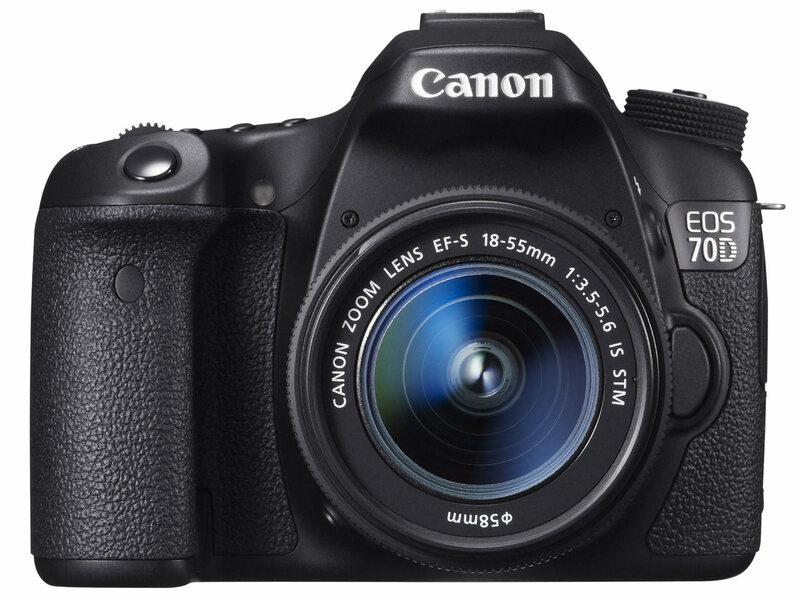 Like EOS 6D, the 70D is also equipped with buit in Wi-fi. Now you can control all the basic function of the camera wireless from compatible devices. Using Wi-Fi connectivity, users can connect to the EOS Remote app and control a wide range of image settings, including ISO and exposure, as well as focus and release the shutter. Photographers can also remotely use Live View mode, as well as review and rate their images. The new 70D is also eared by DIGIC 5+ Image Processor, to ensures that images are captured, processed and saved with remarkable speed. The DIGIC 5+ Image Processor also works to capture and process data of images shot at 20.2 megapixels at 7 fps, as well as 14-bit signal processing for excellent image gradation, enhanced Face Detection Live mode, Full HD video recording, Auto Lighting Optimizer and Lens Peripheral Optimization etc. With 12800 base ISO settings, expandable up to 25600, the EOS 70D ensure capture of the finest detail shooting from sunrise to sunset. 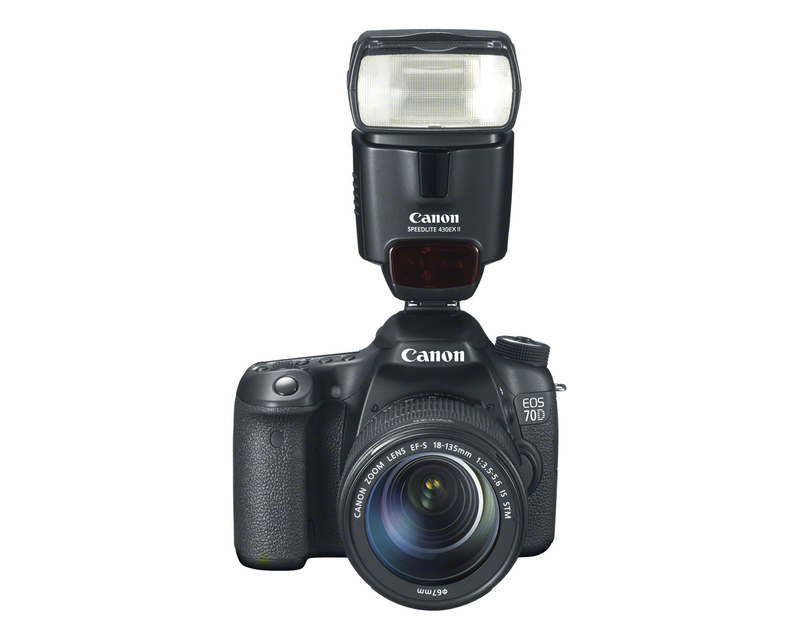 Now you can capture Images clearly and easily at manageable shutter speeds without flash. 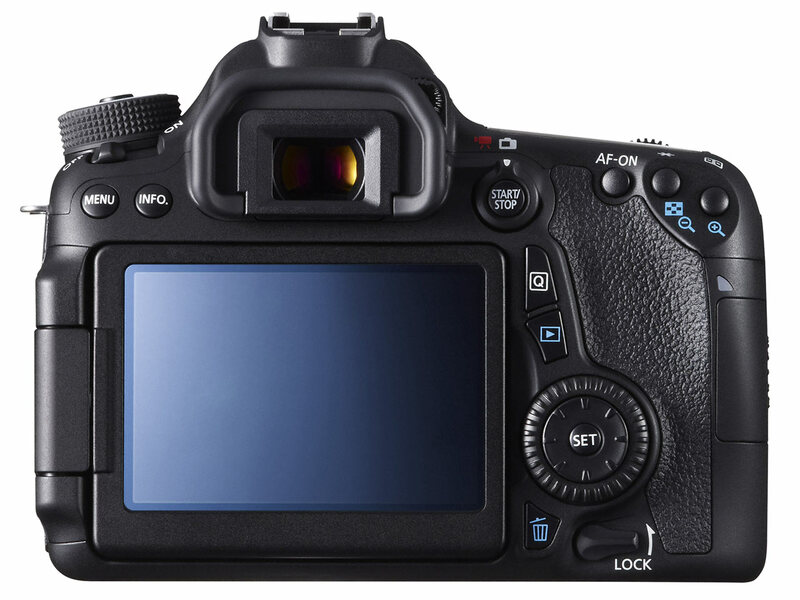 The EOS 70D operates with such effortless speed that operation is nothing short of intuitive. With speedy autofocus and minimal shutter lag, the EOS 70D is made to capture even rapidly-occurring scenes with stunning precision. Able to shoot up to 5.3 frames per second (fps), capturing a maximum burst of approximately 64 Large/JPEGs and 16 RAW, the EOS 70D DSLR lets you catch even the briefest of moments, whether it’s a faced-paced soccer game or the flicker of a candle flame. The EOS 70D features a phenomenally redesigned viewfinder that not only offers an improvedThe Intelligent Viewfinder, with 98 per cent frame coverage and 0.95x magnification, it also features a newly designed transparent LCD display that enables a number of viewfinder displays. A six-level battery check indicator has been added on the left, and the exposure level indicator scale has been expanded to up to three stops, with arrows indicating greater exposure levels. 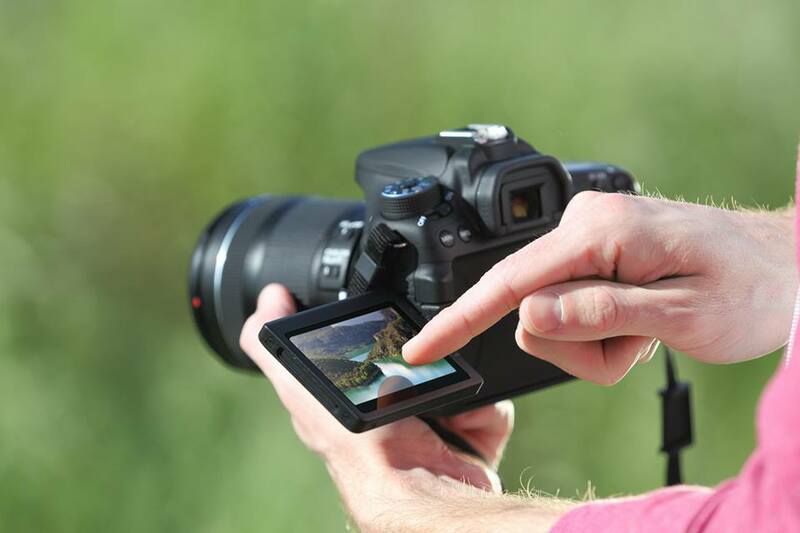 The EOS 70D features HD Video recording–manual exposure control for more creative control. By shooting video with the EOS 70D, photographers as well as filmmakers can take advantage of the creative features native to DSLR cameras. Full HD (1920 x 1080p) resolution video can be captured with a choice of selectable frame rates, including 30, 25 or 24fps, and 60 and 50fps at 720p, and a range of compression options for post-editing and sharing. Besides its manual controls, ability use of Canon EF and EF-S lenses, including Macro and Fisheye, opens a wide variety shooting options once reserved only for still photography. Additionally, a Movie Crop function is included: An SD-quality video (640 x 480) can be cropped to the equivalent of about 7x magnification of regular shooting. EOS 70D features a bright, high resolution, flip-out Vari-angle 3.0-inch Clear View II LCD monitor for shooting at a variety of angles. 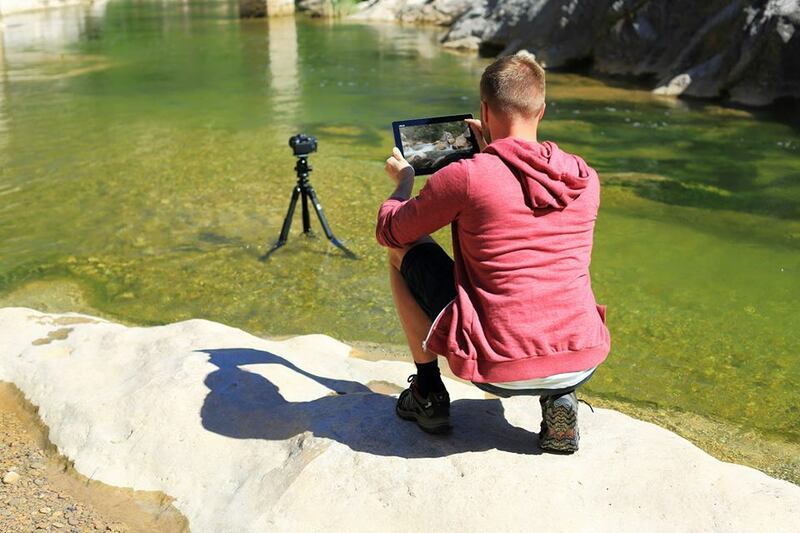 Easy switching between low and high angles, even when the camera is mounted on a tripod or has a battery grip attached, helps in critical composition.With 1,040,000 (dots/VGA) pixels for spectacular detail, the advanced, smudge-resistant monitor includes high transparency materials plus anti-reflective and water-repellant coatings to provide clear and bright viewing. Thanks to touch screen capability,the Vari-angle Clear View LCD monitor is also the perfect means for accessing camera settings like ISO, metering modes, AF Point selection, the horizontal Electronic Level and flash options. 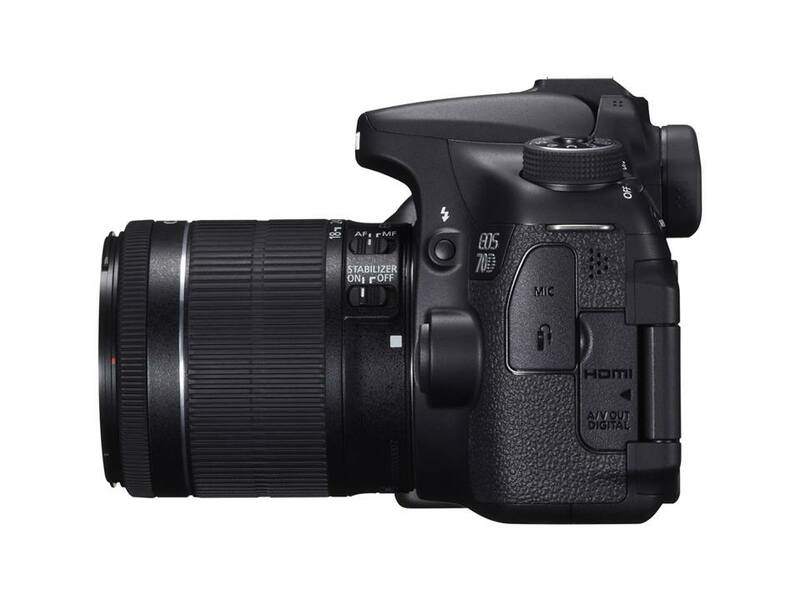 The EOS 70D features a magnesium alloy body that is dust and weather resistant and shutter durability of up to 150,000 cycles and Powered by a new New LP-E6 Battery. According to canon the EOS 70D has water and dust resistance ‘equivalent to Film EOS-1N’ – a professional 35mm film SLR from mid-1990s. 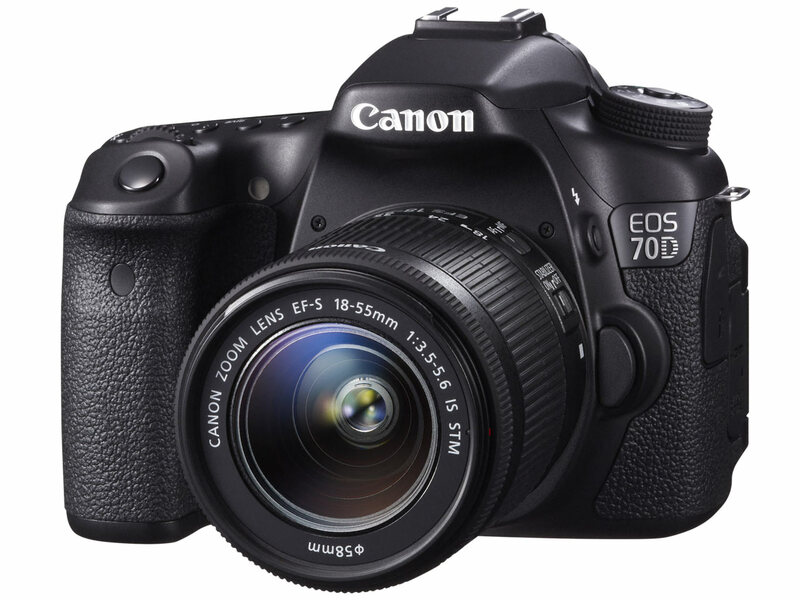 The EOS 70D DSLR uses popular SD, SDHC and SDXC memory cards. Compact, inexpensive and available in increasingly large capacities, SD, SDHC and SDXC memory cards are a perfect complement to the EOS 70D DSLR’s compact and lightweight body design. The EOS 60D is compatible with entire range of Canon EF and EF-S lineup, ranging from ultra-wide angle to super telephoto lenses. With a flash sync speed of 1/250 of a second, the EOS 70D also features the acclaimed E-TTL II flash metering system. With any of the flashes in the EX Speedlite line (sold separately), E-TTL II provides reliable flash output whether shooting fill-in flash pictures in sunlight, or using flash in total darkness. Additionally, the EOS 70D has a Speedlite transmitter built-in for convenient, full-featured wireless control of EX-series Speedlite flashes set as slave units. AF Lock Locked when shutter button is pressed half way in One Shot AF mode or AF-ON button is pressed. AE Lock Auto: In One-shot AF mode with evaluative metering exposure is locked when focus is achieved. Depth of Field Preview Yes, with Depth of Field preview button. Metering Real-time evaluative metering with image sensor. RAW+JPEG Simultaneous Recording Yes, any combination of RAW + JPEG, M-RAW + JPEG, S-RAW + JPEG possible. Power Saving Power turns off after 1, 2, 4, 8, 15 or 30mins.